New video: Celebrating 125 years! 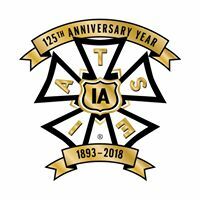 As you are no doubt aware, on Thursday August 9, 2018 the International held a celebration of our 125th Anniversary in New York City in conjunction with the mid-summer meeting of the General Executive Board. During that event, a new video that celebrates the history of our great union and the impressive work that our members do was shown to the attendees. Below you will find a link to that video for you to share with your membership. We will also be releasing it on the IA website over the coming days and later in September we will send you a high definition version of the video on a flash drive.